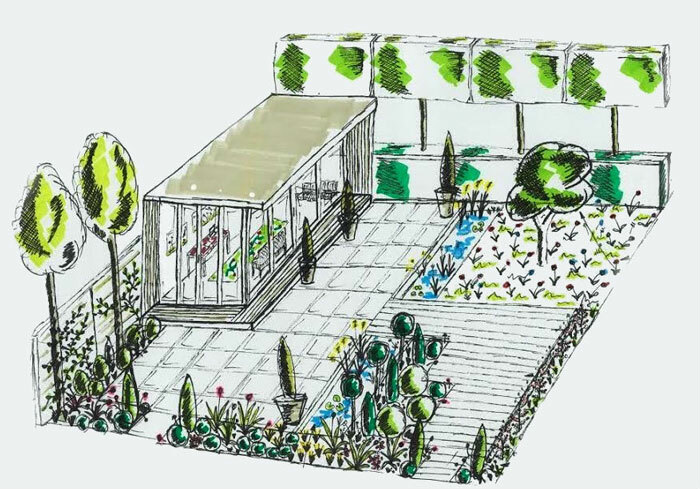 The Show Gardens at BBC Gardeners’ World Live are known for their inspirational design and planting while at the same time offering practical ideas that visitors can recreate in their own gardens. The 2019 BBC Gardeners’ World Live will be no exception. Held at the NEC Birmingham between 13th and 16th June, the Show will be offering feature gardens, APL Avenue, Showcase Gardens and the popular Beautiful Borders, in a relaxed atmosphere, with plenty of time to browse and enjoy. ‘The Watchmaker’s Garden’ (above) designed by Alexandra Froggat is inspired by the booming Jewellery Quarter of the late 1800s. The watchmake’’s workshop is set in a back garden and visitors will find him in mid production on the iconic Chamberlain clock face. Nasturtiums and climbing peas scramble up posts while trees and shrubs border the garden. 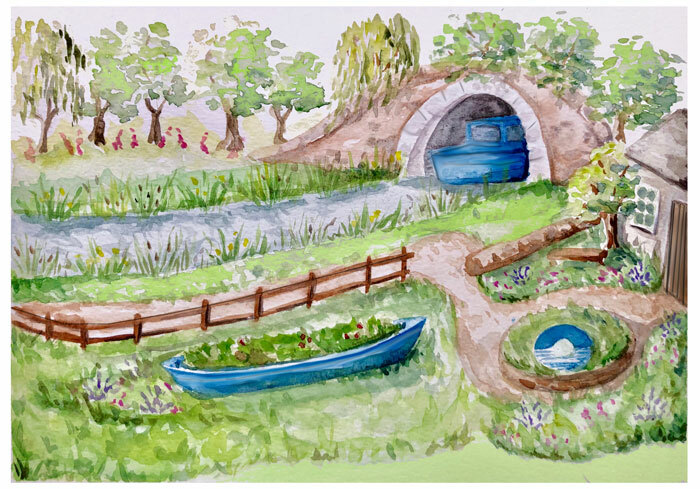 ‘Canal and River Trust Garden – Making Life Better by Water’ (above) – designed by Chris Myers. Experience the calmness and wellbeing of being close to water as you visit this full-sized waterway complete with floating narrow boat. A garden surrounds the central canal and features a vegetable garden, a small private garden of calming and therapeutic flowers and a woodland of native trees. ‘Dahlia Garden designed by Jon Wheatley’ – Jon returns to BBC Gardeners’ World after winning Platinum in the 2018 Show. He will be bringing a walk-through Dahlia Garden, promising a technicolour of blooms including the latest new dahlia to be launched at the Show by Jon. ‘Macmillan Legacy Garden’ (above) designed by Martyn Wilson – you can read a preview of this gardener on our website here. 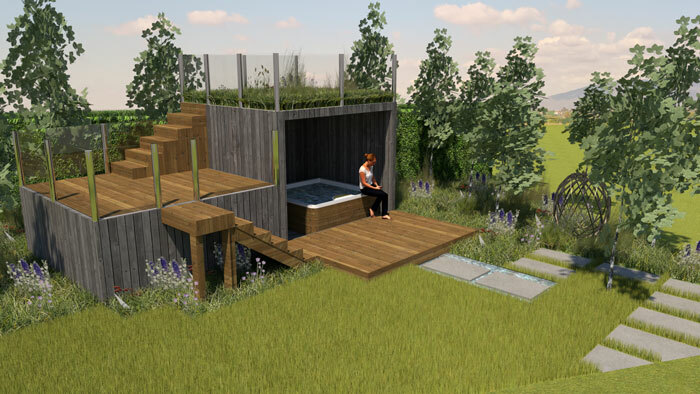 ‘Onward and Upward’ (above) designed by Andy Tudbury, Halcyon Days Garden Design – maximising the available space by including a roof garden and raised deck, this garden takes you along a meandering path through a wild flower area. The inclusion of a Jacuzzi within the building demonstrates the first step to recovery. 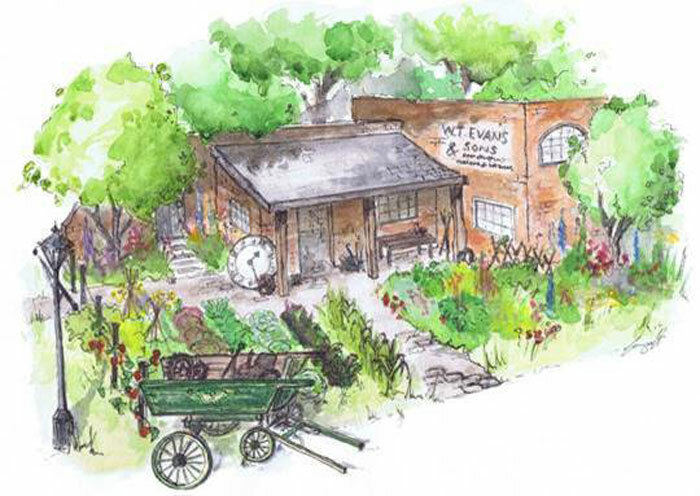 ‘The Marshalls Garden’ designed by Johanna Elvidge – this year the Marshalls Show Garden will encourage visitors to ‘fall in love with stone’ and all things made in Britain. 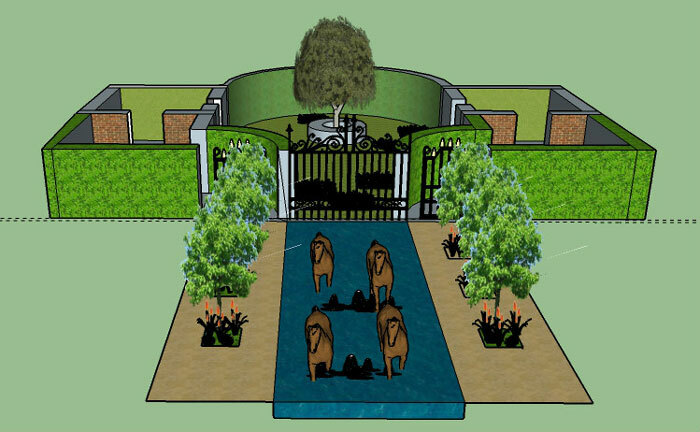 ‘Revelation – MS Society Garden’ designed by Mike Baldwin and Derby College – a design full of drama, four horses charge out in front of golden gates through canal water surrounded by Catalpa trees. A large walled garden area contains a series of rooms including a Fibonacci style cobbled ammonite mosaic. The Partners Garden is an inspirational and usable space that visitors will relate to. Shows what you can achieve in a small area with a combination of formal and informal soft landscaping. 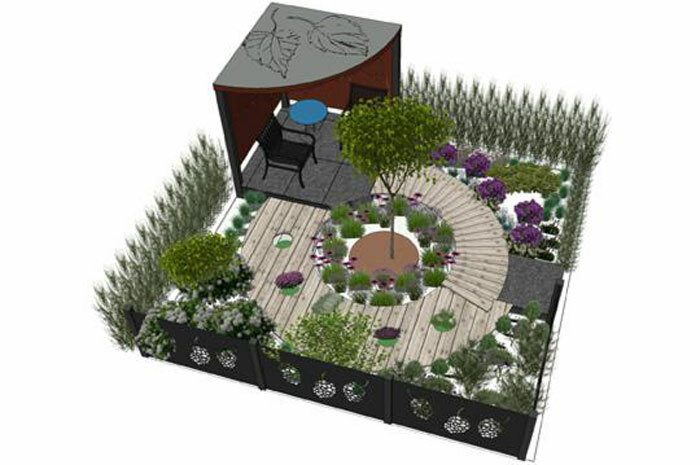 ‘Rebuilding Lives with Legacies’ – Stroke Association Garden designed by Alex Daley and Phil Pooley. The design represents the journey of stroke survivors, with its path starting in a barren, rocky and unforgiving place before becoming softer, with an increasing abundance of life before reaching its crescendo in an elevated, level, social area. The Young Landscapers Award Gardens by David Stevens (sponsored by Marshalls) – marking the second year of the BBC Gardeners’ World Live Young Landscapers Competition, this important competition encourages newcomers to the profession as well as showing visitors ways to use Marshalls landscaping materials. This year four contestants took the top spots at the WorldSkills UK Final in November – Matthew Wood, Sam Gordon, Reece MacKay and Brian Hughes. ‘Here We Go Round the Mulberry Bush’ (above) designed by Armstrong Landscapes and Hana Leonard, brings the nursery rhyme to life in a small garden combining traditional plants and planting with modern landscaping materials. Marshalls will be the suppliers of products to all garden displays at BBC Gardeners’ World Live. All Show Garden designers and contractors are able to benefit from Rowlawn’s Sponsorship and will benefit from their Medallion Turf and fertile growing media. All images ©BBC Gardeners’ World Live and individual designers.